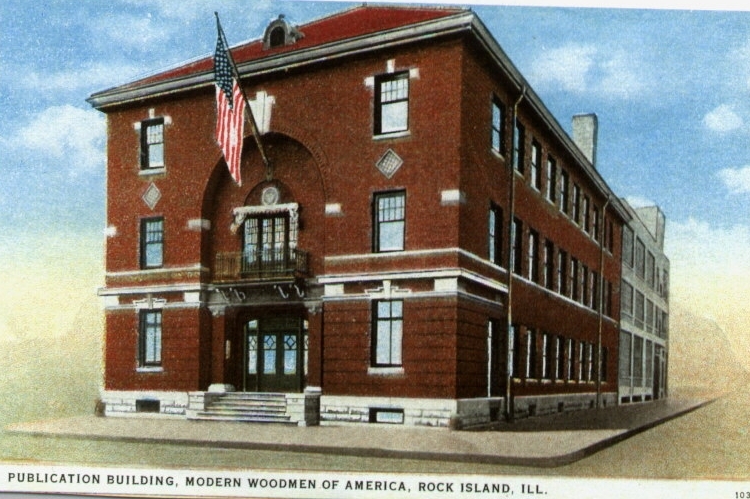 This postcard shows the Publication Building of Modern Woodmen of America (MWA) that, for 75 years, was located at 318 16th Street right, behind the current Rock Island Police Station. MWA moved to Rock Island from upriver in Fulton in 1897 and shortly thereafter constructed their first building here, a Home Office on the southeast corner of 15th Street and Third Avenue. Basement space in that office building was used for their printing department. Major printing jobs, however, were contracted to private companies, not necessarily located in Rock Island. In 1906, the Post Office ruled that MWA’s news magazine, “The Modern Woodman,” must be mailed from Rock Island, not a printer’s location. In response, the Modern Woodmen Council decided they must build their own printing plant. Rock Island architect George Stauduhar drew the plans for the new building, to be known as the Publications Building. It was to be located on 16th Street just around the corner and behind the Home Office. Designed in the Italian Renaissance style, it featured a red clay tile roof above brick and limestone walls. The small dormer at the front of the roof was designed to hold a clock. Notice the huge recessed arch that frames both the impressive main entrance and the second floor balcony which has an iron railing. Above the balcony window, the MWA emblem was created in mosaic tile in the large circular inset. Other architectural details on the front include keystones over the windows and beveled stonework joints on the first story. These elegant details extend around the sides a short distance, but are then supplanted by plain utilitarian brick courses, appropriate to the building’s industrial use. The printing operation soon outgrew its 50 by 100 foot building, and, in 1922, an addition was made at the rear of the building that doubled its size. That addition is depicted as a shadowy sketched outline, and it may represent the architect’s concept of the new addition, thus dating the postcard to circa 1920. Publications of all kinds were very important to MWA – some say that the continued success of this fraternal organization is due to its outstanding communication with its members. MWA itself is quoted early in the twentieth century as saying “no organization anywhere has ever kept its members more fully informed of every detail of its affairs.” It’s hard to conceive now, but the Argus reported that an estimated number of 20,000 out-of-town people attended a MWA picnic here in Rock Island in 1901. Through the years, MWA’s success and need for communications and hence printing facilities grew. By the 1980s, MWA needed yet another expansion of the printing facility. This resulted in a new building, located east of 20th Street near Second Avenue. As MWA has expanded into new spaces, Rock Island County acquired their historic buildings –both the Home Office and the Publications Building. The Home Office adapted easily to county offices. But what about the Publications Building? Despite its elegant exterior, its interior – both the original and the addition – was utilitarian rather than beautiful. It was, very simply, a printing plant, with a heavy-duty design; strong enough to support a large print operation. That strong structure and lack of interior partitions meant it could have been adapted for many other uses. So what use would work? In 1989, the community got the final answer – this elegant Italian Renaissance Publications Building would be razed for a 50 by 200 foot addition to the county parking lot. Although the building was designated a local landmark by the Rock Island Preservation Commission, that wasn’t enough to spare it from demolition. Sometimes we end these stories by suggesting you drive or walk by a historic site for a closer look. This time, we don’t think it’s worth your effort. This article by Diane Oestreich is slightly modified from the original, which appeared in the Rock Island Argus and Moline Dispatch on January 20, 2002.